In September last year, the U.S. Navy had confirmed that it would be replacing the periscope used on previous submarines and instead be using Microsoft Xbox 360 controllers to operate periscopes on its newest submarines, and Virginia-class submarines. Now, almost six months since the announcement, the USS Colorado – the U.S. Navy’s newest and largest Virginia-class attack submarine – went into service last Saturday. The USS Colorado is the first attack submarine to use an Xbox controller for maneuvering the photonics masts. Other submarines have joysticks. The controller operates two photonics masts, which house visible and infrared digital cameras on top of telescoping arms. “The Virginia-class, fast-attack submarine, USS Colorado (SSN 788) is equipped with non-penetrating digital camera periscopes called Photonics Masts. “Normally, submarines are built with two classic style periscopes. The Technical Insertion called TI-14, and Advanced Processing Build APB-13, allows the Photonics Masts the option to be controlled with wired video game controllers. 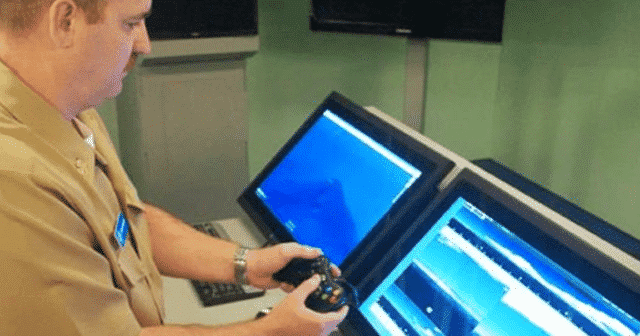 “Though others have tested prototypes, Colorado is the first submarine operating from the start with the gaming controllers,” states the US Navy site. The high-resolution cameras on the masts can rotate 360 degrees and feed imageries to monitors in the ship’s control room. According to Cmdr. Reed Koepp, the Colorado’s commanding officer, using off-the-shelf technology not only helps the Navy save money but it is also advantageous as many of the young sailors already know how to use the controllers. The new submarine, which is 377 feet (115 meters) long, 34 feet (10 meters) wide and weighs approximately 7,800 tons when submerged, went into service from the naval Submarine Base New London in Connecticut. It is the 15th member of the Virginia class of submarines to join the fleet. Attack submarines are built in a partnership between General Dynamics Electric Boat in Connecticut and Newport News Shipbuilding in Virginia at a cost of around $2.7 billion apiece.